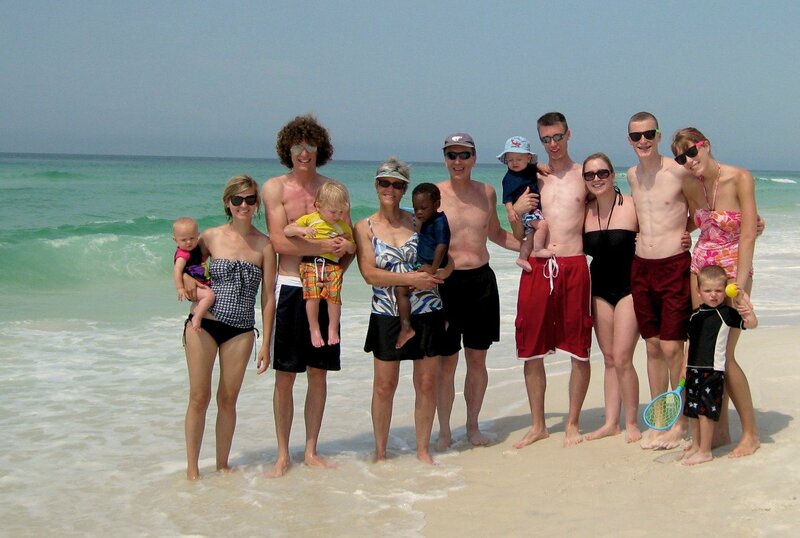 We just got home from our week at the beach... We had a wonderful vacation! 1. The jogging stroller was a hit! We did have to carry it over the dune walkway (the stairs part) each day, but we got our system nailed down and it wasn't really a big deal. On a couple of days, Reed actually fell asleep in the stroller during a beach walk, and snoozed for a bit while we parked him in the shade of an umbrella. A few times he just requested rides in his chariot to "chill," but not necessarily sleep (it was his normal morning nap time). When not occupied, the stroller doubled as an extra beach chair, good for keeping things up out of the sand. I stuck the cooler in the underneath basket so that it was always shaded, and used the small zipper pocket on the back as a "sand-free zone" for phones, ipods, and the like. We attached the mommy hook to hang bags and sand toys as needed. 2. Schedule. Some of our beach-loving friends who also have a toddler told us that they always hit the sand by 8AM. Since our vacation time zone was an hour behind and Reed decided to wake up between 5:45 and 6:30 each morning (except for the last day of course), we had no trouble testing this early-out schedule! "What!? Was I up early, Mom?" Matt was a little reluctant, but I loved being out on the beach before most people. Usually, we would head up for lunch and nap around 10:30 or 11:00, just in time to avoid the most dangerous sun rays. My favorite part of each day was back at the condo, relaxing on the balcony overlooking the beach during Reed's midday nap. We would usually return to the beach and/or pool around 3:00. An added bonus to early rising + the time difference is beating the dinner crowds if you plan to eat out. Of course, vacation always works best with a go-with-the-flow mentality. We started out super early at the beginning of the week, and our schedule naturally shifted to a little bit later by the time we left. 3. We didn't end up bringing an inflatable pool or any big containers, but we did fill a few buckets with water for Reed to play with in the shade. Um, jackpot! 4. I want to report on one last product. My friend Lisa ordered a powder pouch (www.powderpouch.com) for her recent trip to the beach, and loved it so much that she sent it with us on our vacation too. It is basically a pouch filled with talc powder that effectively removes sand from your skin. We actually didn't even get to try it out ourselves because every time we left the beach we sprayed off with the water hoses and then hit the pool before heading upstairs to our condo. It would be a great for any time you didn't chase the beach with a dip in the pool (or even if you did), were planning to eat on the beach, or had to change the diaper of a sand-kissed baby. glad you had a nice trip! what condo did you guys stay at? We were at the Island Princess- It was a great set-up! The umbrella and chairs were included and set up for us each day!! (Matt's mom booked the condos through vrbo).